Icarus Films: Give Us Our Skeletons! This is a film about a man and his lineage, and it is the story of a century pervaded by racism, oppression and the persecution of peoples low down on the list of "noble races." 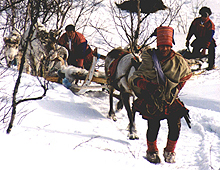 Niillas Somby comes from a small group of Sami, or Lapps, who inhabit northern Scandinavia. He is fighting an almost Kafka-esque battle against the Norwegian authorities, trying to compel them to release the skull of a rebellious ancestor. Mons Somby, Niillas' ancestor, and Alask Hetta were executed in 1854 for murder, following a rebellion against the government, which claimed two Norwegian lives. Their bodies were claimed by the State for scientific research, and their skulls are held to this day, part of a collection of 900 skulls at The Anatomical Institute, in Oslo. GIVE US OUR SKELETONS! shows the evolution and nature of these racist practices with disturbing archival footage. Many Sami were needlessly subjected to electroshock therapy. In a present day interview with one woman survivor of this, we learn that she was also sterilized against her will, along thousands of other women deemed inferior by Norwegian authorities. Niillas Somby's story is also dramatic. After losing his arm as a young rebel fighting for Sami rights, he fled to Canada, where he lived among the native peoples for many years. Today his rebellion is a peaceful one. GIVE US OUR SKELETONS! follows Niillas as he investigates the story of what happened to Mons Somby and Alask Hetta. Finding the skull of his ancestor proves to be a monumental task. And how will he convince the authorities that Mons' skull isn't rightfully the property of the government, but belongs to the legacy of a long oppressed people?